Alison Chambers and Malcolm Ginsberg struggled through the rain and wind to bring you this report. The Monday was particularly gloomy in all respects but by Wednesday both the weather and the outlook had improved. It is impossible to know visitor levels at this time but the show organizers claim the number of exhibitors, from 48 countries, topped the 2,000 mark, setting a new record. Australia, Lithuania, Libya, Mexico and Tunisia were present for the first time. During the opening day’s storms the exhibition halls were busy and the aircraft standing areas less so! Photographs courtesy Jane Stanbury. Let us start by saying that there were no new sales for the Airbus A380 announced, the first time for many an air show that Airbus has been unable to come up with a new firm commitment for the super jumbo. Production for next year will be 14 units, somewhat less than the 20 originally predicted. The week previously, in Malaysia Steven Udvar-Hazy, head of the world’s largest aircraft leasing organization, ILFC (International Lease Corporation), itself part of IAG, had told Reuters that its order for ten aircraft did have some flexibility in it. “We have the right to cancel or defer any of the orders for the A380 between January 1 and June 30 next year, but that no decision on cancellations or delays had been taken yet.” Airbus to date has delivered 15 aircraft out of a total 200 orders. The Boeing Dreamliner 787 did not arrive at Paris unannounced, nor did it get airborne for its maiden flight. What we do know is that it should fly by Tuesday 30 June, something that Scot Carson, President of Boeing Commercial Aircraft Company, confirmed during a well-attended but somehow lacklustre media Paris briefing. As far as big aircraft were concerned the 747-8 freighter was in assembly mode for the lead aircraft and Lufthansa were still contracted for 20 passenger versions. He said for the future a stretched 787 called the dash ten was a possibility, a re-winged 777 was also being considered, as was an all-new wide-bodied design. “All are potentially competing alternatives" to meet future customer needs. A replacement for the 737 was a long way off. The new “Boeing Sky Interior” is the standard kit on all deliveries from the end of next year. In terms of orders Boeing had little to say, only announcing a single order, and that for two 737-800 for a Tokyo-based leasing company, the aircraft destined for Skymark Airlines, also of Japan. Initially Airbus had not programmed any press conferences, but as the week unfurled orders did materialize, 24 A320 series for Qatar Airways, Air Asia X with a commitment for ten of the new A350 XWB. Vietnam Airlines signed a USD1.4bn firm order for 16 A321s. In addition, Air Asia X expressed confidence in Airbus' newest aircraft product with a firm order for ten A350-900s valued at USD2.4bn. There were MoU (memorandum of understanding) commitments for a further 69 aircraft. These MoUs comprised: 50 A320s for Wizz Air worth USD3.8bn; ten A321s for Indian-based Paramount Airways worth USD900m; two A330-200s plus five A330-300s for Turkish Airlines together worth USD1.4bn; and two A350-900s for Vietnam Airlines worth USD480m. Other firm airliner orders made during the show include: Cebu Pacific, which ordered five A320s; Aigle Azur for one A319; and Zest Air of the Philippines which became a new Airbus customer with an order for one A320. It is also worth mentioning an order for one Airbus Corporate Jet (ACJ) A320 Prestige from a private customer. Two new and serious regional jet contenders are edging their way onto the regional airliner scene – Mitsubishi Aircraft Corporation (MJET) of Japan with its MRJ90 and Sukhoi of Russia/Italy with its Sukhoi Superjet 100 (SS100) and both used the opportunity of Le Bourget last week as their debut international showcase. MJET President Hideo Egawa led a delegation to Paris, declaring interest had been “better than he hoped for” for the all composite 86 to 96-seat jet. To date the programme has logged just 15 orders and ten options, from All Nippon of Japan, but it is progressing on confidently through its initial design phase. The goal is to achieve certification by 2013. Partners include Pratt & Whitney (PW127G fuel efficient geared turbofan engines), Rockwell Collins avionics and Hamilton Sundstrand for electrical power. Three versions of the aircraft are planned, the standard with an 870 to 1,200nm range; an ER flying 1,400 to 1,730nm and a long range version, capable of 2,100nm. MJET has put together an Airline Advisory Group comprised of well known, but undisclosed, airlines. By the close of the show the Sukhoi/Alenia Aeronautica Superjet 100’s order book had been bolstered to 122 firm orders, new deals signed with Malév Hungarian Airlines for 15 firm aircraft plus 15 options and 24 from Russian lessor Avialeasing. It also secured a Letter of Intent for two firm orders and two options from Gadair of Spain. Sales for the SJ100 are now on course to meet the 150 strong target by year end, says Sukhoi Holding Company President, Mikhail Pogosyan. Spain’s leading regional and Iberia affiliate Air Nostrum announced the purchase of ten ATR 72-600s, plus options on another ten additional aircraft, switching too to a new turboprop supplier. (Air Nostrum has been a long term Dash 8-300 customer but it opted for ATR, rather than move up to the Q400). Deliveries start in 2011. ATR also announced a sale for the sale of four ATR-42-600s to Royal Air Maroc for its new regional subsidiary Royal Air Maroc Express. The two ATR 42-600s and ATR 72-600s will be configured for 48 and 70 seats respectively. 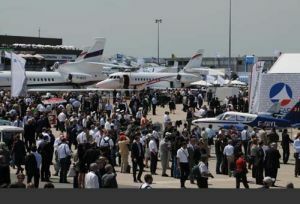 Air Nostrum kept loyal to Bombardier for turbofan aircraft, however, announcing an order on the opening day of the show for 15 more CRJ1000s to take the total number to 35. The Valencia-based airline is the launch customer for this aircraft and deliveries will commence from 2014 through to 2016. 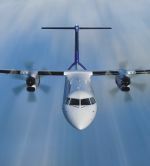 Bombardier picked up a new order for eight 70-seat Q400s from MIG Aviation Ltd, part of Greece’s Marfin Investment Group. The aircraft will be operated by Pantheon Airways under the Olympic banner. Pantheon acquired the assets of Olympic Airlines and Olympic Airways from the government of Greece last year. “The acquisition is an important part of Olympic's fleet replacement programme intended to introduce state-of-the-art air transport technology in Greece's regions,” says Pantheon CEO Antonios Simigdalas, who poignantly, is also co-founder and COO of Aegean Airways. 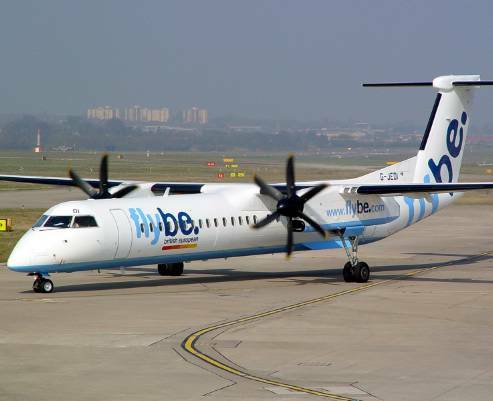 Low Fare and Regional Airline Magazine reports that Pantheon has drafted in Flybe, leading operators of the Q400 in Europe, to assist in the introduction of the type. Commenting on the now established Q400 programme at Paris, Gary Scott, President of Bombardier Commercial Aircraft, said that the proposed stretch of the aircraft is not high on the agenda, largely because of the strong backlog of existing aircraft. (To date 355 aircraft, of which 245 had been delivered as of 30 April.) Known as the Q400-X, the stretch of the aircraft (which can currently be configured for up to 78 seats) is still part of a feasibility study, Scott acknowledged. However, we don’t feel any great urgency to launch the aircraft, particularly as the current aircraft is still so much in demand. “Some customers would take the aircraft today if we had it, but we’ll wait for a groundswell in the demand to push us into a launch”. Bombardier Aerospace said it is on schedule to deliver its first C Series single-aisle airliner in 2013. Bombardier Commercial Aircraft VP Programmes, Ben Boehm, stressed that the company is progressing toward “a realistic 63-month development timeline,” compared with the announced 48 months for the 787. “As many of our suppliers have been on the 787 and A380 programmes, we've factored in much of what’s been learnt on those programmes.” Commercial Aircraft President, Gary Scott, highlighted positive comments from the market and that the company has hit a “sweet spot with this aircraft” – for example, its flexibility to serve London City Airport or all the way across Australia. The five-abreast C Series family is specifically designed to meet the growing needs of the 100 to 149-seat market where Bombardier forecasts demand for 6,300 aircraft in this category, valued at approximately USD360bn over the next 20 years (2009-2028). So far it has attracted 50 firm orders and 50 options from Lufthansa/SWISS and ILFC. One of the star attractions in the halls was a mock-up of Eurocopter’s brand new multi-mission twin-engine EC175 helicopter. Jointly developed with China’s Harbin Aviation, first flight of the heavy 7-tonne helicopter is on schedule before the end of the 2009, with certification in 2011 and service entry in 2012. The aircraft will sell in the Asian market as the Z15. The 16-passenger EC175 is powered by Pratt & Whitney PT6C-67AE engines, featuring a three-blade tail rotor, four-axis duplex autopilot and five flat-panel cockpit displays and is primarily targeted at the oil and gas search and research markets in France and China.